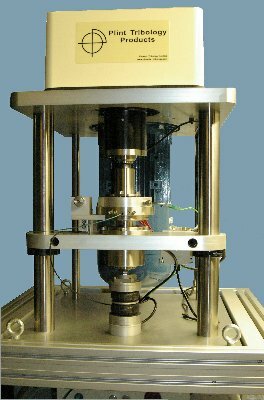 TE 93 Precision Rotary Tribometer provides a lower load range than the standard TE 92 Rotary Tribometer, on which it is based. 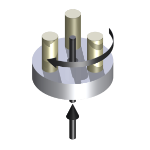 The incorporation of a linear air bushing in the loading and friction torque assembly allows precise control of the load in the range 1 to 1,000 N and corresponding precision in the measurement of friction torque. Load is applied by means of servo controlled pneumatic bellows with force transducer feedback. 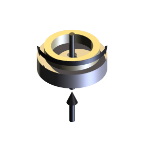 The unit is specifically designed to run tests in the thrust washer and three pin on disc test configurations, with on-line measurement of friction, wear displacement (by capacitance probe) and sample temperature. The control system includes the SLIM 2000 Serial Link Interface Module and COMPEND 2000 Windows based control and data acquisition software. The automatic control of load, speed, temperature and test duration, combined with flexible data logging and alarm level checking, greatly facilitates use of the TE 93 for in-depth parametric studies in the wear of materials as well as more routine product screening. Test may be run in accordance with the guidelines laid out in ASTM G99 Wear Testing with a Pin-on-Disc Apparatus and ASTM D3702 Standard Test Method for Wear Rate of Materials in Self-Lubricated Rubbing Contact Using a Thrust Washer Testing Machine. 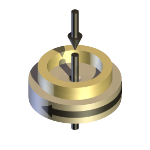 In addition to continuous rotation, a crank mechanism is included to allow oscillating motion to be generated. 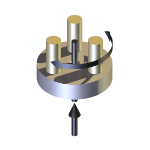 The optional electro-chemical test cell allows tests to be run with three rotating ball on disc/pin on disc configurations. 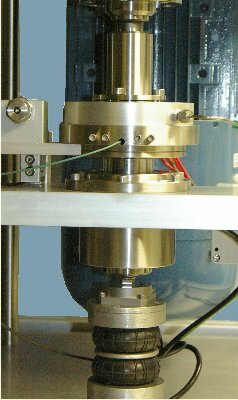 It includes a Faraday cage, temperature controlled fluid circulator and precision shaft slip-rings. A silver/Silver Chloride reference electrode and a platinum mesh counter electrode are included. The potentiostat, which is triggered by COMPEND, is a Gamry Instruments Reference 600 Potentiostat/Galvanostat/ZRA and is supplied with licenses for DC105 DC Corrosion, CPT110 Critical Pitting Temperature, EN120 Electrochemical Noise Experiment, EFM140 Electrochemical Frequency Modulation, PHE200 Physical Electrochemistry, PV220 Pulse Voltammetry, EIS300 Electrochemical Impedance,ESA410 Electrochemical Signal Analyzer, VFP600 Virtual Front Panel, PWR800 Electrochemical Energy software.